It is really amazing how many techniques are out on the Internet to learn. Some are so simple and do not require many supplies to create. If you have a sanding block and brayer you can easily to this technique. Just remember, " Less is better" when sanding the glossy card stock. And really that is all there is to it. Sand lightly glossy card stock going in both directions of the paper. Apply ink with a brayer until you get the look you are after. 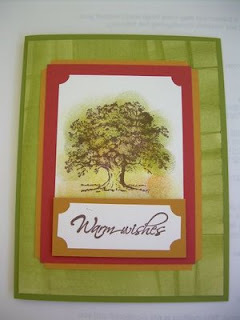 Very easy, not messy and a fun way to have a different layering piece to compliment your stamps. Don't forget the birthday promotion this month. Spend 20.00 and get 20% off special birthday stamps.